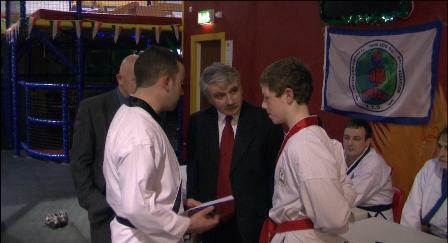 This March we welcomed Grand Master Dominick Giacobbe 8th Dan Black Belt to Limerick. Mr Forde & Grand Master Giacobbe have known each other for a number of years and this was the Grand Masters first visit to Limerick since the establishment of Munster Martial Arts. While here Grand Master Giacobbe had a very busy time meeting with all of our students. 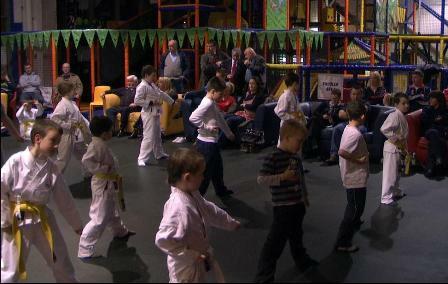 Our first student events were held in the city Munster Martial Arts Academy in Formula for Fun and in the county in Hospital where all the county students attended. There was a very high attendance as lots of students from the city & county had the opportunity to grade over 2 days under Grand Master Giacobbe. All the students did really well and the grading was really positive for everybody. Limerick TD Willie O'Dea & local councellor Kieran O'Hanlon kindly turned up on the night of the city grading and gave their support to our classes & congradulated all students on their success. 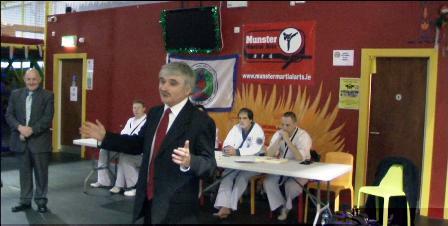 Grand Master Giacobbe also performed a demonstration form which really impressed everybody in attendance. Mr Forde was also presented with a special award from Grand Master Giacobbe and the InterContinental Tang Soo Do Organisation for his dedication to Tang Soo Do in Ireland. On Friday we had a really busy day but started out early to allow some time to visit some famous sites in Limerick. 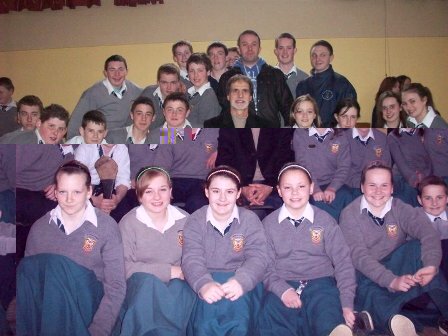 Friday morning found Grand Master Giacobbe and Mr Forde visiting Ard Scoil Mhuire in Bruff. 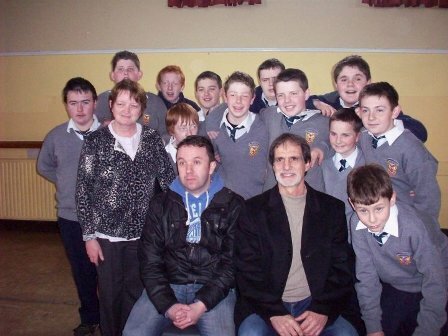 They were invited to speak with students and a large group of students turned up to hear more about Tang Soo Do & the achievements of our students in particular James Meany who is a pupil of the school and has been nominated for a Bank of Ireland Student Achievement Award. Grand Master Giacobbe addessed the pupils also and spoke about his own personal life of training and some of the experiences Tang Soo Do has brought to his life. Later on Friday afternoon were Black Belt Gradings where some of our Black Belt Students Mr Peter McLoughlin & Mr John O'Brien were successfully graded for their 2nd Dan Black Belts. Mr Forde was also graded Masters grade so officially became Master Forde. 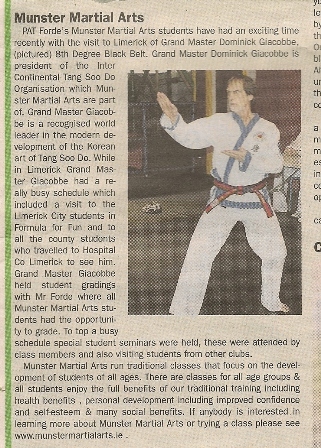 On Saturday Grand Master Giacobbe & Mr Forde featured on Limerick 95 where they were both featured with John Prendergast. Later on Saturday morning Grand Master Giacobbe held a student seminar which was held in Hospital . Co. Limerick. This was very enjoyable and lots of students travelled to attend. After the seminar the younger students enjoyed some time to talk with Grand Master and ask him about he's life experiences.